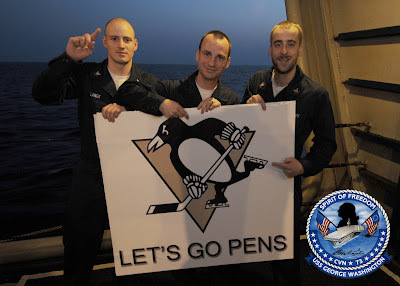 "We’re a few Western PA boys/Pens fans/U.S. Sailors stationed on the aircraft carrier USS George Washington, operating from Yokosuka, Japan. We’re currently underway in the western Pacific, but are still rooting on the boys (when AFN Sports carries the game… and we can get a signal.)" -- Dave R.
"For some reason, I thought that this being the STANLEY CUP FINALS, NBC might have a little bit of pregame coverage before the puck dropped at 8:00. Unfortunately, it appears to be Dateline NBC that's getting the 7:30 to 8:00 time slot. and it's a feature story on Taylor Swift. And I'll admit it, after finding this out, I left it on for a bit, and I'm glad I did because during a scene with her critiquing a rehearsal session of some sort, I saw a familiar sight in the background. Through the beauty of DVR, I was able to capture this still shot. Maybe her tour director was filling Silverback's spot at the White House or something the day they filmed the show..." -- Matt E.
--From Big Bob at 96.1 Kiss: "The Pens gave us a pair of game four tickets to give out. People text the word kiss to the number 32623 to enter. We get a winner on Thursday morning in the 9am hour." Is this it? Was Max Talbot the catalyst once again? Is that the start of history? We will surely find out. I am going to say one word. Momentum. It is vital to winning and losing in high pressure, extreme situation games. After two games back to back, where we never really had too much of it, but still somewhat dominated the games, we finally have it. We know we can outplay them, but until tonight, we couldn't beat them.